The Pittsburgh Steelers are preparing to play their final preseason game on Thursday then rest the remainder of the week. That means the earliest their star running back Le’Veon Bell will see a team workout is Monday September 4. Bell says that a week of practice will be sufficient for him to start playing in Week 1. He said the way that he trains he will only need a few practices as well as game action and he will be ready to go. Bell told the team he would return for Week 1 after failing to negotiate the franchise tag the team labeled him with. The way Bell responds during his few practices next week will determine how ready he is to play against Cleveland September 10. Trey Williams a running back for the Steelers has been in three training camps in the NFL and knows that taking snaps and dodging oncoming defenders wearing pads is near impossible to simulate. Just the added weight of the pads makes a big difference than just going through the motions without any pads on, said Williams. 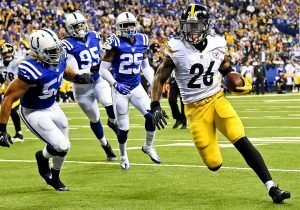 Nonetheless, Williams called Bell a horse and said whatever he is given for practice before the first game, he will be ready come game time. Pittsburgh has four practices before their opening game with one being with pads. Ben Roethlisberger the starting quarterback said Bell is an amazing player but he has prepared with other running back Knile Davis, Fitz Toussaint and James Conner in case Bell needs to be taken out during Week 1. Davis and Toussaint have been starters in prior NFL games, and Conner ran for 98 yards in Pittsburgh’s second preseason game. The group is not flashy, but will help lessen any burden on Bell in his preparation for Game 1. Most NFL pundits believe Bell will be able to hand between 15 and 20 carries against Cleveland during Week 1 after just four practices. Roethlisberger said that the sport is violent but Bell is physical when it comes to running backs so the team has to hope the other players can step up if Bell needs a breather. Big Ben said he does not know if Bell can play every down like he typically does each week for the Steelers.